A rabbit hole, that is! In December you doubled over in side-splitting laughter as K & Q tracked a killer down an audacious path of guts, gore, and paranomasia. Now they are back, as Alice and the Mad Hatter, ….wandering through the whole of Westinland, on a quest to find Alice’s (uhm, Alex’s) stick…Er, uhm, sword, well, manhood. And boy, is THAT a long story! One you certainly will regret missing! And to be clear, it is not quite two men….Well, uhm…okay, you got me. We are not sure, yet. But what we know is that with all the trips, dips, and spins, in this gender calamity, it will be one heck of a ride for ALEX in WESTIN-LAND. So buckle up, hang on to your hat, and prepare for a bushel of fun! 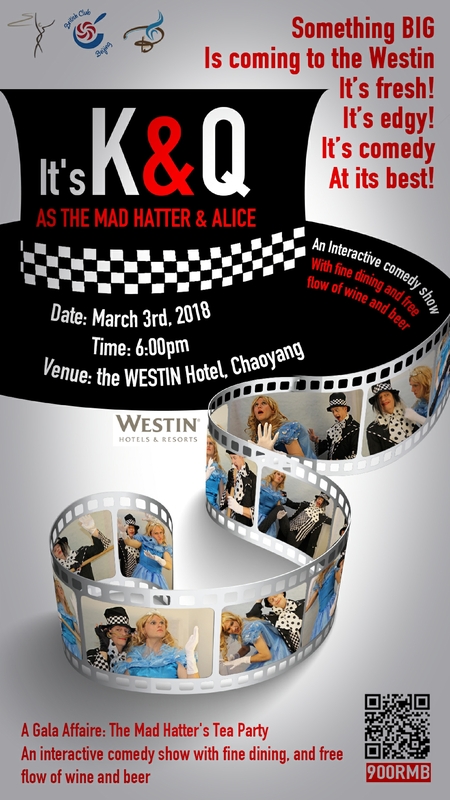 Beijing Fringe Theatre has teamed up with the British Club Beijing in association with The Westin, Chaoyang, to bring you a deliciously, devilish blend of fine dining, interactive theatre entertainment, and action performance like you have not experienced before. A potent cocktail that is guaranteed to make you addicted to the brilliantly enchanting wit and symbiotic banter of K & Q. ← Previous Previous post: Bloody Mary’s Debut: A Smashing, Sold-Out Show! Next → Next post: So You Think You Can Act! !